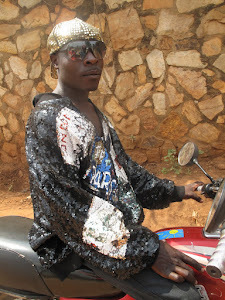 Bodaboda Baby: "I'd rather be safe than stylish". 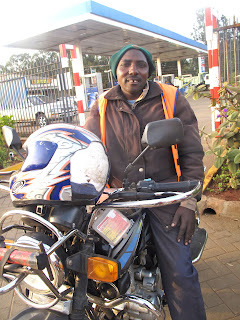 Meet Walter & John, two Nairobi boda drivers. "I'd rather be safe than stylish". 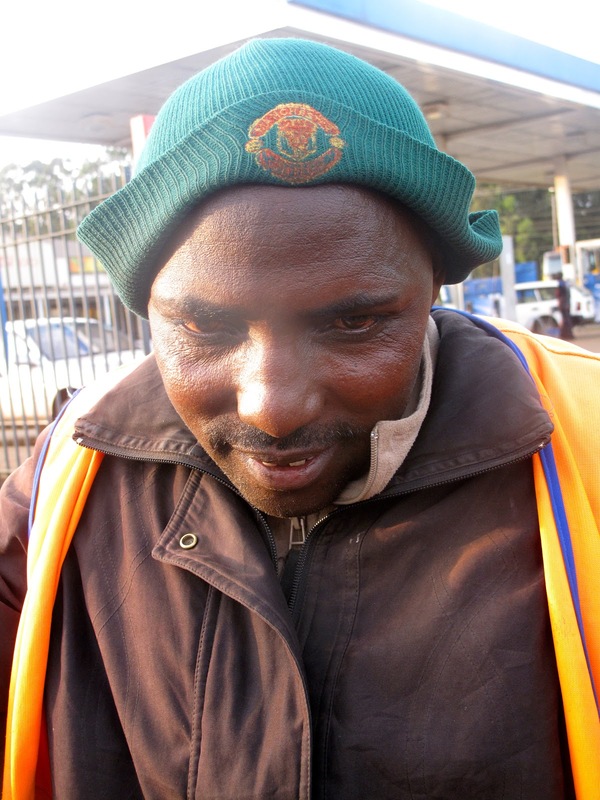 Meet Walter & John, two Nairobi boda drivers. 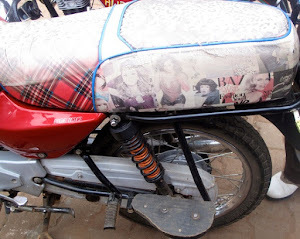 When you live on Boda Boda Boulevard in Kampala, which I'm sure they could rename my street in the Ugandan capital, and spend a large part of your day with your booty on the back of a motorbike, flying into Nairobi is weird. 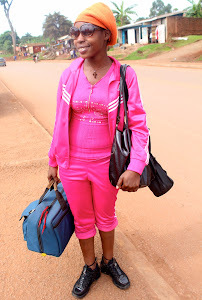 The first question I asked myself on the drive from the airport to my camp was: "Where are all the bodas?" According to this Radio Netherlands Worldwide story, Kenya's Economic A survey indicated that the number of bikes in the country rose from nearly 4,000 units in 2005 to over 90,000 in 2009. I'm the first to admit that I'm staying in the bum ***** middle of nowhere (that's what you get for choosing an Aussie-run establishment - not that I picked my hostel for this reason). But even when I've been into town I still haven't spotted many bodas. 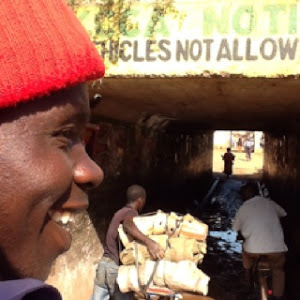 I'm also now starting to feel the impact of the lack of bodas in Nairobi versus Kampala where it hurts the most. 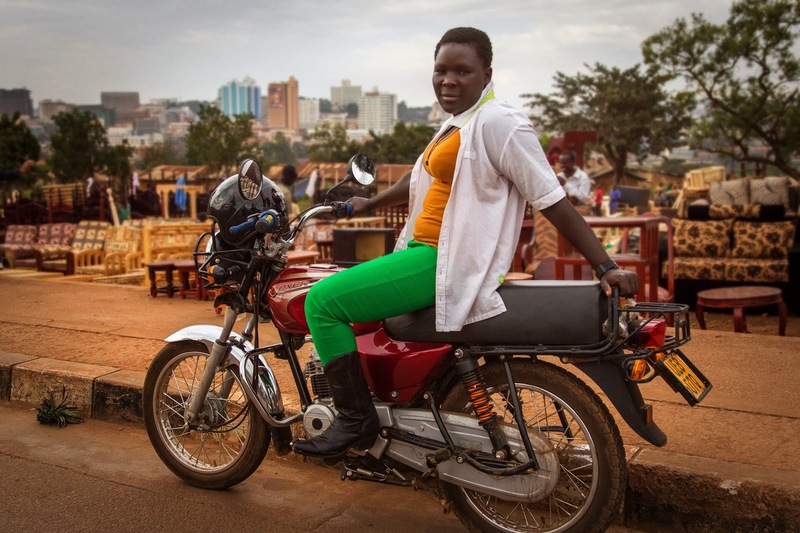 While an average boda trip to downtown Kampala from home sets me back 5,000 UGX ($1.86), I'm now paying at least 1,500 KSh ($17.44) to get into the city with private hire, as there are no bodas near where I'm staying and I'm not 100 per cent confident I won't get lost on the buses! 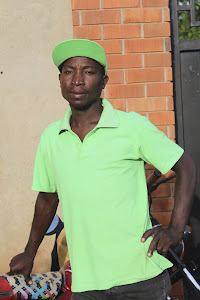 Through my taxi driver Edwin, I tracked down Walter Obade, 35, who has been a boda driver for three years. He was born in Nyanza, southwestern Kenya, and is from the Luo tribe. Walter, who's married with two children, swore to me there were more than a million bodas in Nairobi and surrounding areas. (Yes, I did question him on this). His sidekick, John Oleomo, 42 is a Maasai and has been a boda driver for the same length of time. He has two wives and four children. There are 14 drivers at their stage in Karen, in Nairobi's southwest. Just days before new traffic rules take effect in Kenya, I went to Java House at Galleria Mall to speak to these partners in crime. 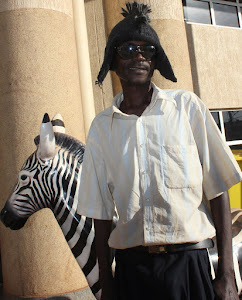 Q: The big difference I notice, coming from Kampala to Nairobi for the first time, is that there aren't as many bodas. Walter: I think Kenyans more than like bodas. In rural areas they are a main means of transport. They like it so much. There are actually about a million in Nairobi and surrounding areas. I think it also depends on unemployment. When the rate of unemployment is high you have to look at an alternative way of surviving. 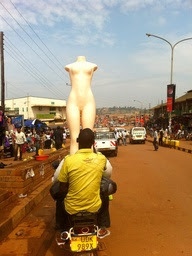 In Bungoma (western Kenya) there is even a female driving a boda. John: The Maasai like keeping cattle, they like keeping animals. Very few Maasai drive bodas. At my stage I’m the only Maasai rider. They like keeping cattle so they normally follow the animals. That’s the job they like most. 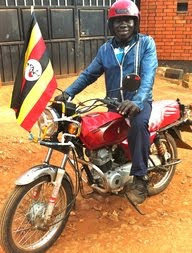 Uganda has its boda king, Walter. 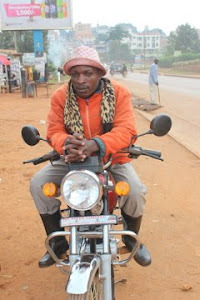 Kenya has its boda king, also a Walter. Q: Is traffic in Nairobi bad? Walter: The traffic is very congested but it’s an advantage to us because if there’s a flow of traffic our job will also reduce. If you want to rush you town, you are not seeing the jam, you will take the car. But if you want to rush to town, you are seeing the jam, you’ll come on the bike because you can manoeuvre because of the car. 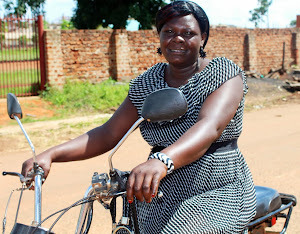 Q: How did you get into boda driving? 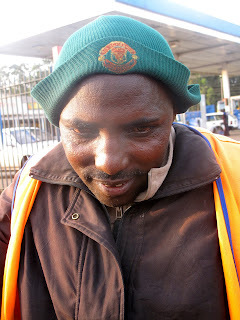 John: I was working in security when I came to Nairobi. I saw people riding these bikes and I said "let me also try". A well-paying job needs a complex level of education. Like maybe you are a university graduate. 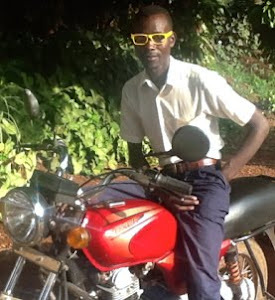 But I did not make that education so the only job I can do which is well paying is (driving a) bodaboda. I can support the family very much. 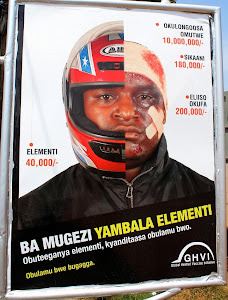 In security I was only earning 400 ($4.65 USD) but with the bodaboda when the day’s good I make up to 3,000 ($34.88). Walter: I used to be a security man also. I found that security was not paying well, so I bought one bike. 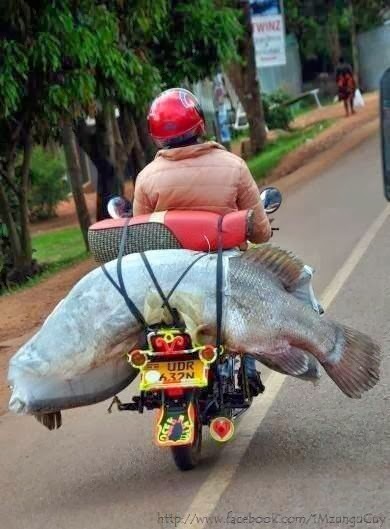 Before I left the job I confirmed that this thing (boda driving) can pay better than the previous work. When I found out that I can make 1,500 KSh a day I decided to leave the job which was paying 400 KSh a day. When these things started (in Nairobi) we had to try. 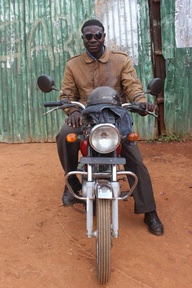 Masai boda drivers are very rare in Kenya, says John. Q: How much your bike cost? 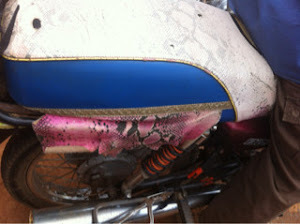 Walter: It cost me 75,000 KSh to buy my bike. 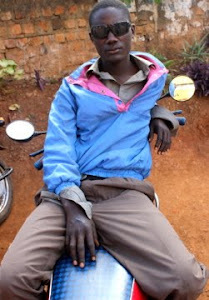 It was not a lot of money to buy my bike when the job can pay me between 1,500 and 2,500 KSh a day. If you squeeze yourself for one or two years you can manage to get one. Q: Where do you get the bikes from? Walter: They came from China and they were a little bit cheap. These bikes have been here for now around three to four years, the cheap ones. The expensive ones like Yamaha, they were there a long time ago but people couldn’t afford them. When these ones came from China they were a little bit cheap so we could afford them. Walter's red-hot helmet. On fire! Q: Who are your normal passengers and where do you go? Walter: I normally take anybody. From here to town we can charge 500 to 600 KSh. From here to Karen we can charge 200 KSh. The working class. Maybe you’re going to work, you’re late, you’re going to buy something in town and you need to go before the jam so you take the bike. It’s a little bit faster. There are lots of jams in Nairobi, it’s very bad. I have regular passengers. You may get someone who’s working at Wildebeest (a hostel) so everytime he comes to work he calls me. I’m late can you take me. John: We go everywhere, even outside town, Mlolongo. Sometimes we are being called. "I am late, can you please take such and such person?" The customers are working people. I go all around Nairobi. 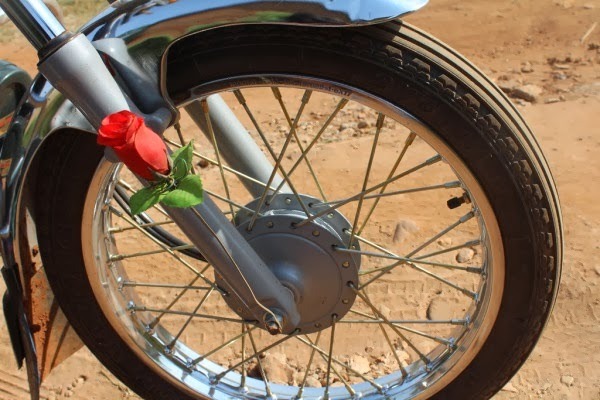 Q: Do people in Nairobi generally like bodas? John: At first they used to be scared. But as you carry them they become used to it so it becomes normal. "I'd rather be safe than stylish". Q: Is driving a boda in Nairobi dangerous? Walter: For some it’s dangerous but for some it's not. For anything that's moving if you are cautions it’s alright. What causes the accident mostly (is when) somebody takes the bike today, he goes around. The following day he starts taking passengers. He does not know the routes of the road. They don’t go to (driving) school, they just take the bike, they go around, they carry you. After two or three days he knocks someone down. Q: Is it easy to get a license? Walter: It’s not easy to get a license because in school you need 7,000 KSh to get the license. I hope with time I’ll get a car. Then I’ll become a private taxi driver. Q: Have you had any accidents? Walter: For three years I’ve had no accidents. It’s only that one time when I carried an engine. Then I went slowly. It was the engine of a car. It was a little bit heavy. I didn’t fall completely but there was a hole that I nearly went down. John: There was a time when my bike was knocked but I wasn't injured very much. 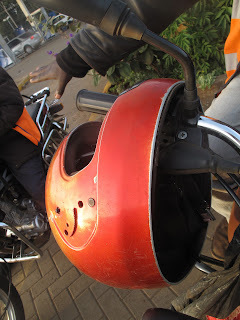 Q: What's the major problem you face being a boda driver in Nairobi? Walter: Robbing is a major problem. The criminals do come mostly at night from 9pm but not regularly. Even my friend when in town he parks his bike. When he comes back he finds there’s no bike, it’s gone. It happens. Bikes are being stolen very regularly. 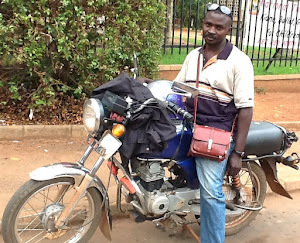 Q: Do you think there should be more support for boda drivers? Walter: If our government can support us with the necessary equipment we’ll be alright. Maybe they (can give) us these safety jackets free, the tyres, education. We can lecture people how to be safe on the roads. Q: Do you like the job? Walter: The job is quite alright, it’s okay. I like it very much. This thing is paying me well, it’s a little bit well paid. John: I like the job very much. If you are somewhere where you get some money you have to like it. I think more Masaai should get into driving the boda. It’s a good paying job. If you get into it (and) you see you can make a difference, you’ll just like it. 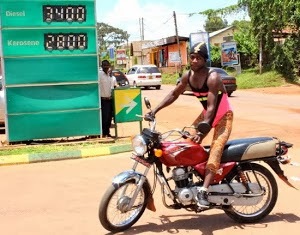 "A bodaboda cannot afford rider's clothes because these clothes will be costing 10,000 KSh," says John. 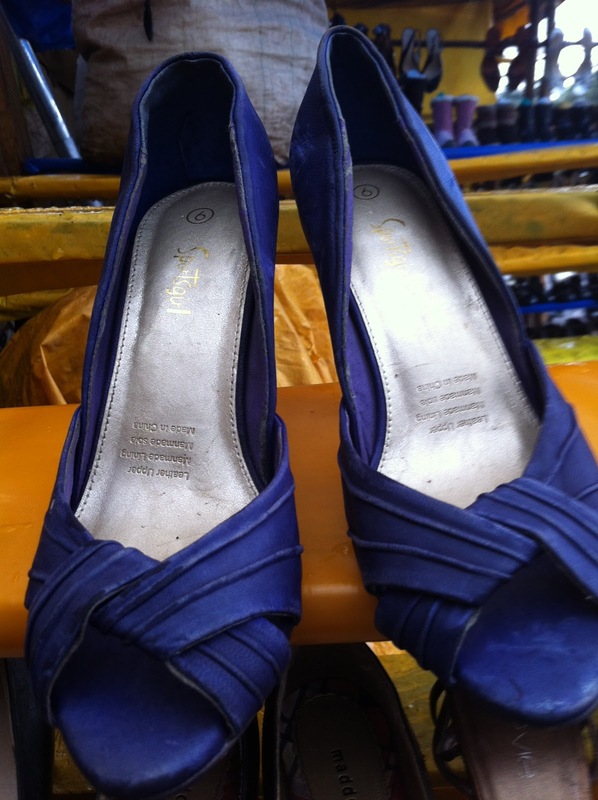 "You cannot afford that so you have to get secondhand clothes from the market. I’d rather be safe than stylish." 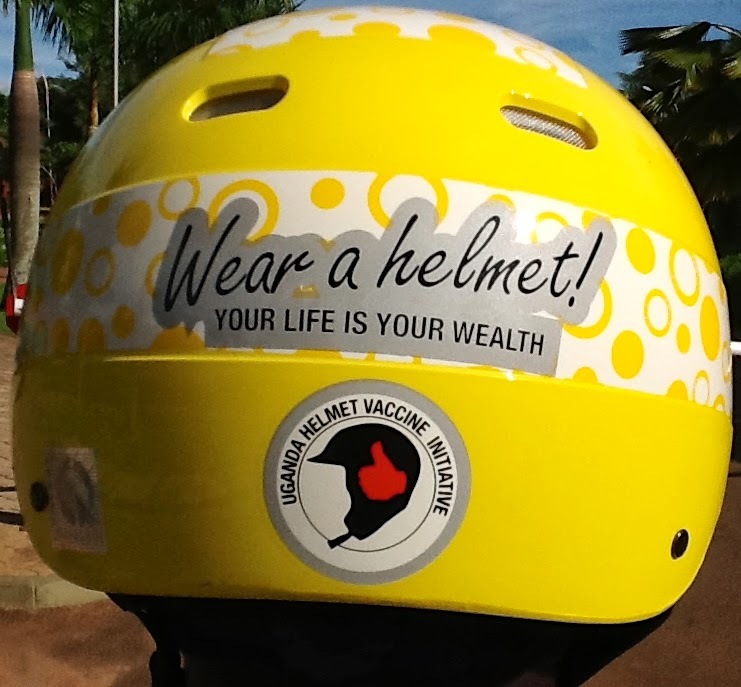 "We do wear helmets. As a rider you have to put (one) on. When you're caught with the police, if you're not wearing a helmet you’ll be arrested. You have to be careful. You normally get the helmet free when you buy the bike. Otherwise you can buy a Chinese one from 600 KSh. This leather jacket goes for 300 or 400 KSh at the markets. You can afford it. But the correct jacket may be 10,000 KSh. You may not be able to afford." Security vest reflective 100 KSh. from 200 to 500 KSh. Start at 100 Ksh and go up to 200. A shame there's not more female boda drivers in Kenya. These purple heels from Australian label Sportsgirl, which I found at the markets near Adam's Arcade in Nairobi, would look great on any rider. See some more items she could pick from here.